Bila sam u Rimu. Bila sam Rimljanka. Pila sam espresso i prosecco za doručak, focaccia za užinu, pizza za ručak, a tripe alla romana za večeru. Jela sam gelato. Vozila sam bicikl po parku Borghese, i durila sam se ispred basilica st Pietro. Na pijaci sam se cenkala, a u metrou sam čitala. Najgori obrok sam najviše platila, a najbolji najmanje. U urgentnom centru sam progovorila italijanski. U Rimu sam gledala Fellinijev Rim. U Rimu sam kuvala. U Rimu sam se u Rim zaljubila. U prelepom delu Rima, Trastevere, ušuškan u lavirintu ulica, nalazi se restoran u kojem se održavaju časovi kuvanja. Nas dvanaestoro se tog kišnog jutra našlo u toploj i prijatnoj kuhinji. Los Anđeles, Njujork, London, Melburn i Beograd - tako smo se upoznali. Sledećih šest sati smo se kroz brašno, seckanje i mešanje testa sprijateljili. Šef Andrea nas je uveo u pripremu izvornih italijanskih recepata iz regiona Lazio, Rim. Savršena kombinacija istorije, kulinarske prakse i malih tajni velikih kuvara. Uživajte i zabavljajte se u pripremi hrane, to je najvažniji sastojak. Recepte objavljujem na engleskom sa instrukcijama koje smo dobili od šefa Andrea. 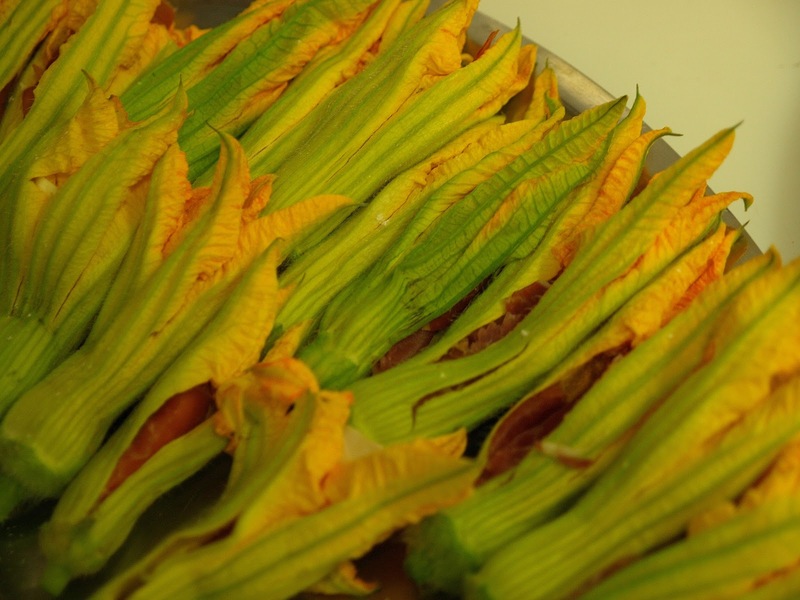 - 1 bowl of mozzarella for pizza or fresh mozzarella "Fior di Latte"
Clean your pumpkin blossoms very carefully trying not to cut or damage the flower and get rid of the pistil and stalk. Then cut thinly slices of prosciutto and/or eggplant and wrap them into mozzarella squares. 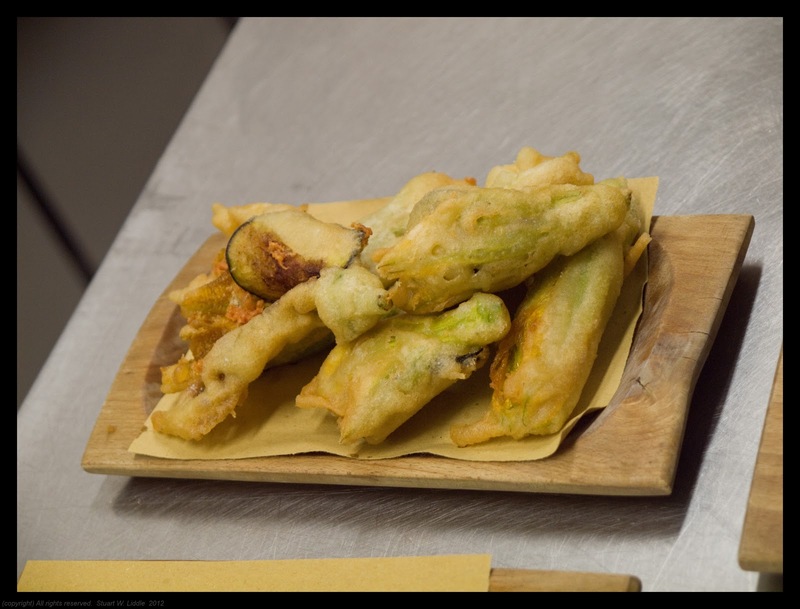 If you can, I'd suggest you to avoid using buffalo mozzarella or bocconcini, as they have too much milk and they might splash back by the time you'll deep fry them, so try to get mozzarella for pizza or Fior di Latte that would be better! For the batter you have to mix all purpose flour and cold beer until a smooth and elastic compost, add the remaining of the sparkling mineral water and one teaspoon of E.V Olive oil and one teaspoon of salt. If you can I’d suggest to add few cubes of ice to make the batter crunchier, unless the beer you're using is very cold (almost frozen from the freezer). Suggestion: If you want you can make the Southern Style Pesto, that you can use as a dipping sauce (or you could even use it as a pasta sauce). In a food processor, add cherry tomatoes, E.V. olive oil, almonds, salt, garlic (remember to get rid of the heart of it, which makes it heavier to digest) and fresh organic basil leaves. Blend it until smooth and creamy. If the sauce is too liquid because the tomatoes had to much water, add a handful of Parmesan cheese and blend again. Serve to dip your blossoms. Mix 4 cups/400gr all purpose flour with 4 eggs. Then roll out the dough powerfully to a thin, almost transparent sheet (don’t forget to use flour on the marble surface). Now it's time to cut the pasta into the fettuccine shapes, long and thin. Let the pasta sit and rest for few minutes before cooking, then put a large pot of boiling water over high heat. When the water is boiling, toss in a tablespoon of salt with the fettuccine. Stir to keep the pasta from sticking. Cook for 3 or 4 minutes, until a piece of pasta tastes cooked. In the meantime, in a large frying pan over medium-high heat, saute garlic with extra virgin olive oil (remember to leave the skin on and do not burn the oil, just wait for garlic to get brown). Than add chopped tomatoes that you have previously boiled and peeled, and allow them to cook and saute. After the tomatoes have cooked down for 5 to 10 minutes, they'll look softer and release some water, add salt. You are able to add some fresh cow milk ricotta and if you like also some chili to give a spicy touch to it (but not too much). In the end add freshly chopped basil leaves. When the pasta is cooked, drain it and add it to the frying pan with the tomatoes. Add Parmesan cheese and garnish with basil leaves, serve hot. Wine Pairing: Marmorelle, it's Frascati Superiore DOC - it's a pure Frascati grapes from the Winery Principe Pallavicini ed. 2009 (Colonna - Rome - Lazio). Saute in a frying pan garlic smashed without peeling the skin (as it contains all the nutrients and it's good for the anti-oxidant nutrients) and the mushrooms, cover with a lid and wait until all the water will be released for about 8-10 minutes with a lid (timing will depend on the type of mushrooms you are using). The add dry white wine and let it cook under high heat to let the wine evaporate as quick as possible. In a different frying pan, heat up the extra virgin olive oil and flour the meat, then brown the thin slices of tenderloin and saute for few minutes. Add salt in the end, not while cooking otherwise you'll dry out the meat slices. The outside should be nicely browned, but it should still be tender and soft overall. Spoon the beef over the mushrooms sauce, and let it season for a few minutes under low heat and add freshly chopped parsley in the end. In the meantime prepare a dish and adjust the rest of the meat and mushrooms over, and serve hot. It will be delicious. In a large frying pan over low heat, stir in the extra virgin olive oil and the clove of garlic, then try not to fry too much the garlic otherwise it'll become brown and you will kill all the nutrients contained in the skin of it. Then add the zucchini diced and turn on the heat over medium-high and let them get brown. Add the zucchini flowers in the end (get rid of the pistil first, otherwise it will be sour taste), and let it cook stirring every now and then until soft and add salt in the end. Season your dish with salt and chili flakes if you like, and serve hot. To make the custard all you have to do is mixing egg yolks and sugar in a bowl whisking until smooth and soft. After add the flour and in the meantime over medium heat bring the milk to a boil with lemon zest in infusion. Add the milk to the flour mixture as soon as it will start boiling and put back over the flame stirring for a few minutes, until thick and creamy. Remove from the heat and let sit until cool. For the peaches all you have to do is to clean them, chop them into small pieces and let them cook into a non-sticky pan with a tbsp of unsalted butter, let them cook under low heat and add the granulated sugar. As soon as all the juices are evaporated, add the brandy and let the alcohol flambe in the way that it will not release too much sour taste to the peaches (be careful to the high flame!). Then adjust the peaches on top of the cream in a Martini glass for a nice presentation. Garnish with mint leaves and whipped cream for decoration! E svaka ti čast kako si našla vremena i za čas kuvanja. Očigledno da nisi bila na onim kratkim turama od 5 dana, tj. 3 dana u Rimu, dva u prevozu. Moram ovo lepo da proučim. ps u Urgentnom progovorila? Nadam se da si dobro! Draga Jelena, bila je to tura od 9 dana. Prošli put jeste bila tura od gore pomenutih 5 dana trčanja i obilaženja znamenitosti... ovaj put sam htela da zagrebem malo dublje. Bilo je divno. U Urgentnom je bio Aleksandar usled pokretanja kamena u bubregu, sve je prošlo ok... ali eto i to smo doživeli. Velika preporuka za ovaj kurs. Jelo, blago tebi... Extra! Sjajni recepti! Bravo Jelo odlična ideja! Ja se nikad ne bih setila da odem u Rim i u to da smestim i čas kuvanja. Pogledala slike na FB, fantastične su. Videli se da ste se baš lepo zabavili. Žao mi je zbog Aleksandra, nadam se da je sada dobro. Drago mi je da ti se dopadaju slike, a nadam se da ćeš i neki recept isprobati. Hvala na pitanju, Aleksandar je sada dobro, a ostaje nam za uspomenu avantura odlaska u urgentni centar i pokušaj sporazumevanja sa medicinskim sestrama. Jao Jelo miline!!! Blagoš tebi, mogu misliti kako je ispunjavajući bio taj dan. odo sad na fejs da vidim fotke!